I am a big fan of the Tweetie iPhone app as a way to manage Twitter on my iPhone. So when I heard that Tweetie 2.0 was being released – and that it is awesome – I quickly downloaded it. This is despite my brother’s horror that I would pay for any iPhone app. To me, a good app is well worth the $2.99. - The cool interface changes of a blue light indicating when I have new messages, new direct messages or new @ replies, and the way that you load additional messages by pulling down to refresh. 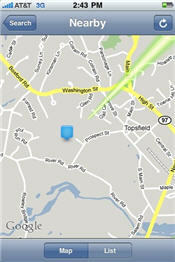 - Although I haven’t figured out a way to really use this feature yet vigrx vs vigrx plus, I love that I can see all the most recent Tweets that have happened “nearby” – it’s very interesting to see how many (in Beverly, where I live) or how few (in Topsfield, where I work) people are using Twitter. I could see how this feature might come in handy if I was somewhere new and wanted to write to ask someone for a local tip, although I haven’t used it that way just yet. Also, I found out that there is a death metal record label right down the street from my house in Beverly – totally interesting. – The ability to manage multiple Twitter accounts is the reason that I fell in love with Tweetie to begin with, and the 2.0 version has only simplified the way that you can toggle between multiple accounts, apply changes to multiple accounts, and to send messages from one account when you’re reading messages in another. I have always loved Tweetie and found it the best app for managing Twitter on my iPhone, and Tweetie 2.0 is a significant and awesome upgrade that I highly recommend. THE ONLY THING IS – I have a question that I can’t seem to find an answer to anywhere – if anyone knows, please leave a comment! 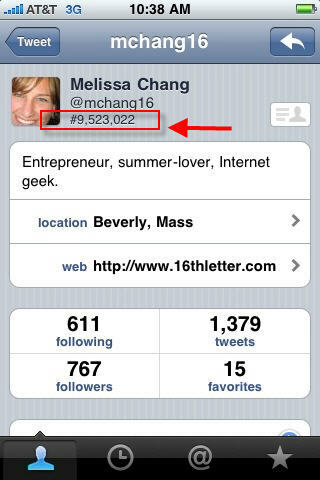 What are these numbers (pictured below) that show up on someone’s profile page?